Othello Air Force Station (1951-1975) - A Cold War long-range U.S. Air Force Radar Station first established in 1951 near Othello, Franklin County, Washington. Named Othello Air Force Station on 1 Dec 1953 after the nearby town. Initially assigned a Permanent ID of P-40 and later a Sage ID of Z-40. Abandoned in 1975. 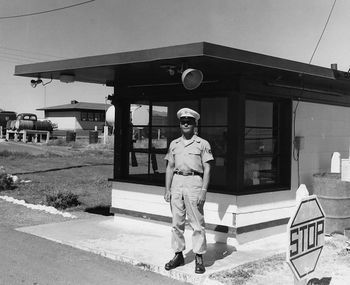 Othello Air Force Station Main Gate, Motor Pool in Background. 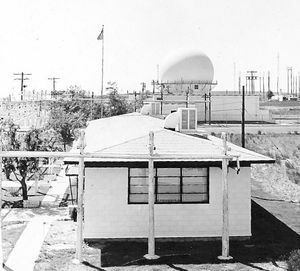 Othello AFS Orderly Room, OPS Building, Radome and Radio Site in Background. Othello AFS, two FPS 6s on the left, FPS 3 in the bubble and Operations building on the right, circa 1959. Established in September 1951 with the relocation of the 637th AC&W Squadron to the newly constructed radar station. Initial equipment included the FPS-3 and FPS-5 search radar sets. The site radar equipment evolved into an FPS-3 search radar with two FPS-6 height-finder radars while the site was still a manual Ground Control Intercept (GCI) site. The transition to the automated SAGE system began with the installation of the GPA-37 analog intercept control system which allowed local controllers to vector interceptors to their targets. Operation of the GPA-37 continued even as the site was being upgraded to the automated SAGE system with the FST-2 installation and the search radar upgrade to the FPS-20. The FST-2 equipment digitized the radar returns and transmitted the digital returns to the SAGE direction center. Under the SAGE System, interceptor aircraft were directed to their targets by the direction center computers and controllers, greatly reducing the need for local controllers and equipment at every radar station. Jan 1953 - 8 Oct 1954 Geiger Manual Direction Center SM-172 4702nd Def Wg. 1 Sep 1958 - 15 Mar 1960 Geiger Manual Direction Center SM-172 4700th AD Wg. The site began operation as a SAGE site on 15 Mar 1960, initially feeding the Larson SAGE Direction Center DC-15 at nearby Larson AFB. With the closure of DC-15 in 1963, Othello was connected to the McChord SAGE Direction Center DC-12 direction center at McChord AFB. The search radar was upgraded to an FPS-7C and that was later modified to become a FPS-107. 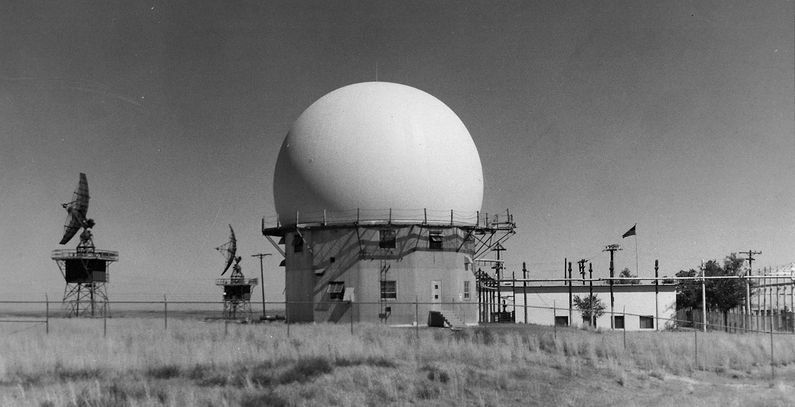 A FPS-26A height-finder radar was installed in 1963-64. Othello AFS was selected as a Backup Interceptor Control (BUIC) site to back up the Sage direction center in case of failure. BUIC I operations began in 1962 and ended 1 Mar 66. BUIC III operations began in the late 1960s with the installation of the BUIC III, GSA-51 computer system. Othello AFS was not originally on the list to be a BUIC III site but was substituted for the third Canadian site that the Canadians declined to build. As the threat from Russian aircraft attack changed to a missile threat, the need for the backup BUIC systems evaporated and it was deactivated in 1974. Othello AFS reverted back to a SAGE surveillance radar station role with the removal of the BUIC facilities. Othello AFS and the 637th were deactivated on 31 Mar 1975 as the need for the SAGE system itself was reduced. Othello AFS was responsible for the maintenance of two remote unattended gap-filler radar sites. The unattended gap filler sites were placed in locations where the main search radar lacked coverage. These sites were equipped with short range FPS-14 or FPS-18 search radars and FST-1 Coordinate Data transmitters that sent digitized radar target data to a SAGE direction center and to the main radar site. Both the radar set and the FST-1 were dual channel to increase site up time. Maintenance teams were dispatched for regularly scheduled maintenance or when fault indicators on the FSW-1 remote monitoring equipment suggested the site had problems. The FSW-1 also allowed remote operation of specific functions such as channel changes for the radar and for the FST-1, it also allowed remote operation of the diesel generators at the gap filler site. The Othello AFS gap-filler radar sites were located at Wenatchee and Okanogan, Washington. The physical plant of the site was divided into the main site, a housing area, and a radio site. The main site housed the operations building, the radar towers, the enlisted barracks, the bachelor officer's quarters, the orderly room, the chow hall, the motor pool, and the backup generators. Just outside the main gate was an NCO club. Across Radar Road (now Sage Road) from the main site was a small housing area for critical married personnel. The housing area was initially built with 9 units and later expanded to a total of 27 units. North of the main site was a separate SAGE System Ground to Air Transmitter/Receiver (GATR) radio site housing radio equipment for directing aircraft intercepts from the SAGE direction center. Before the SAGE System was implemented there were separate radio transmitter and receiver sites for local controllers to direct aircraft intercepts. 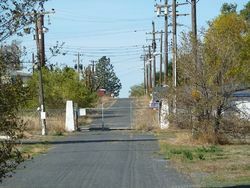 The original transmitter site was repurposed as the SAGE GATR radio site while the receiver site was used for storage. 25 May 1951 - Transferred to the 162nd AC&W Gp. 1 Dec 1953 - Site redesignated to Othello AFS, WA. 1 Sep 1960 - Redesignated from AC&W Sq to 637th Radar Sq (SAGE}. 1 Mar 1970 - Redesignated as 637th Air Defense Group at Othello AFS, WA, assigned to 25th AD. 1 Jan 1974 - Redesignated the 637th Radar Squadron. 31 Mar 1975 - Inactivated. Othello AFS Plan circa 1975 when the site closed. Display T-33 Jet and Plaque Remember the Radar Base. Now private property. 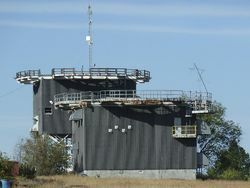 Many of the Air Force buildings remain, including three radar towers. No public access. 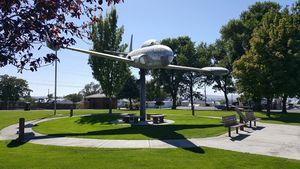 A memorial plaque and a display jet T-33 aircraft are located in the Othello City Park. The Othello Community Museum is now open with limited hours at Third & Larch streets in Othello, WA. The museum has information and displays for Othello Air Force Station. Location: On Radar Hill, 7 miles south of Othello, Franklin County, Washington. Winkler, David F., Searching the Skies: the Legacy of the United States Cold War Defense Radar Program, USAF Hq Air Combat Command, 1997, 192 pages, Pdf, page 165. Cornett, Lloyd H. & Johnson, Mildred W., A Handbook of Aerospace Defense Organization (1946-1980), Office of History ADC, Peterson AFB, Colorado, 31 Dec 1980, 179 pages, Pdf, page 85, 155. This page was last modified 11:32, 5 February 2019 by John Stanton. Based on work by Bill Thayer.